The Super Chick Necklace is very beautiful. 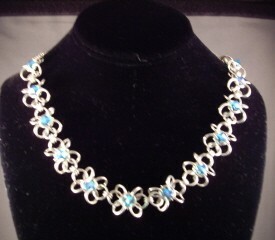 It can be a choker length adjustable to 20 inches. The crystals can be any color and are not supplied in the kit, There are companion pieces in the bracelet and earring sections of the website. This is a beginner weave. A sterling silver or yellow gold filled balloon clasp are included in the kit.